For several generations the Troyer Family has grown premium potatoes in the ideal conditions of the rolling hills of Waterford Pennsylvania. As potato farmers, they know what potatoes need for plump, rich sweetness and solid consistency. 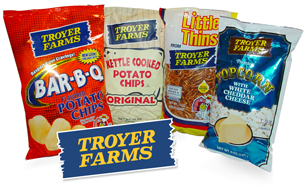 Troyer Farms is the only American potato chips manufacturer that grows its own potatoes. As a result, Troyer Farms claim to produce the freshest chip in the country! Fair enough. Troyer owns nearly 2,500 acres, with over 900 acres dedicated to raising potatoes and 1,100 for wheat and corn. During the local growing season, which lasts from late July until November, they harvest 20 million pounds of potatoes. With 350 staff, chips production and snack manufacturing takes places at a 300,000 square foot facility in Waterford Pensylvannia, and a 35,000 square foot Pretzel Factory in Canonsburg. 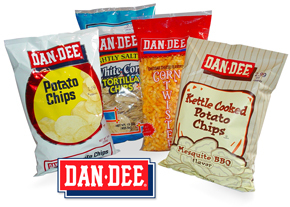 In 1984, Troyer Farms acquired the Cleveland-based Dan Dee Pretzel and Potato Chip Company. 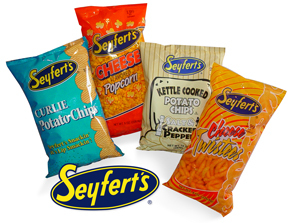 In 2001, Troyer Farms acquired Seyfert Foods, an Indiana based snack food producer. This acquisition allowed Troyer Farms to expand into the Indiana and Michigan markets. All of the company’s snacks, including the Dan Dee and Seyfert brands, produced are below the 0.5 grams/serving threshold put forth by the FDA. In 2007, they used 36 million pounds of potatoes to produce 10 million pounds of potato chips.